ELVIS PRESLEY - 70!!! NO WAY! I find it impossible to imagine Elvis Presley as a 70 year old man. But that's exactly the age he would have reached this weekend. When he died in 1977, that too seemed impossible. Elvis Presley -- the king of rock and roll -- was not supposed to die. But he did...... and three decades after his death, he's still one of the top grossing entertainers in the world, and his Memphis home is one of Tennessee's top tourist attractions. I often wonder -- had he lived -- would the girls (or older women) still swoon over him? Would he still be wearing the outlandish jump suits? Would he have become a respected actor, or still be turning out those mostly silly B-movies? Would he have a hair piece, or perhaps a comb-over? Would he be really fat? Would he have loads of cosmetic surgery, or would he age gracefully and naturally? Would he still be giving free Cadillacs to the boys in his Memphis Mafia? Would he still sing in that rich baritone, or would age and painkillers have taken too great a toll? Would he be a public person, appearing on talk shows, or would he have become a recluse, reminiscent of Howard Hughes, living in a penthouse in Vegas? The album cover attached to the top of this essay is the first picture I ever saw of Elvis. The day I saw it, I had never heard his music. It was around 1956, and I was with friends outside the gymnasium at Langford Junior High School in Augusta. 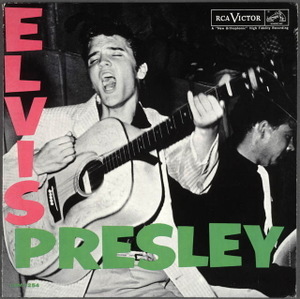 Someone showed me the album cover (actually an extended play 45 RPM), incredulous that I hadn't heard Elvis sing. My friends said they heard he was a dope addict (not true at the time), but that his music was incredible. In those days, I loved the songs my parents listened to. I still do. Rosemary Clooney.... Les Paul & Mary Ford.... Perry Como..... Joni James.... Patti Page..... Eddie Fisher and Eddy Arnold..... and everything Gene Autry sang. But that day, my mission was to listen to an Elvis Presley song. And I did. All of a sudden, here was music that was magic to my ears. Music that my parents didn't like, which probably made it sound even better to me. Acceptable rebellion..... a bond with my peers. I'm fairly certain the first song I heard was "Money Honey", a remake of the old 1953 Drifters' song. In fact, all of the songs on Elvis' first album were remakes, or covers, of songs written and recorded by other artists. But that was part of his genius. He borrowed from all types of music.... and wove it into something new and remarkable. He blended country, rhythm and blues (or "race music" as it was called), white and black gospel, bluegrass, pop standards -- and made it his own. All of his recordings on the Sun label, and most of his early RCA recordings, were covers. "I Love You Because" was recorded first by Leon Payne. And did you know Elvis Presley's ballad "Are You Lonesome Tonight" had been on the charts one year earlier for Jaye P. Morgan, and was even recorded by Al Jolson in 1950.... and had been a hit for a singer named Vaughn Deleath in 1927. But all those early "borrowed" songs represented Elvis at his purest..... before record executives and producers molded him into a record selling machine. I saw Elvis perform only once, in the early 1970's at the Municipal Auditorium here in Nashville. His entrance onto the stage was magical. So many flashbulbs that I thought someone had turned on the house lights in the arena. The band vamped a familiar riff.... the people screamed.... and he launched into "That's All Right Mama", the first song he had ever recorded professionally..... a song written and originally recorded by blues legend Arthur "Big Boy" Crudup. Crudup often said, had it not been for Elvis, few people would know that song.